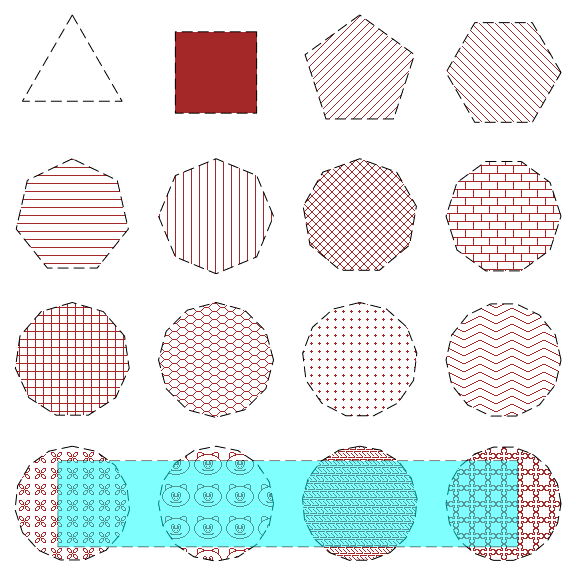 This example highlights the range of fill styles (patterns) provided in ChIPS. Here we use a set of regular-sided regions to show off the different patterns; the other object type that can be filled with a pattern is a histogram, as shown in this earlier example. For this visualization we create a plot that fills the frame, and hide its borders by setting the plot.style to open. We then create 16 regions - using add_region - positioned on a grid designed to fill the plot; since there has been no data added to the plot (i.e. no curves, histograms, contours, or images), the regions are positioned using the plot-normalized coordinate system, which has (0,0) as the bottom-left of the plot and (1,1) as the top-right of the plot. Each of the 16 regions is created with a different number of sides and fill style. We add a seventeenth region across the bottom row, this time providing the vertices of the region as two arrays. Since the opacity of this region is less than 1, the contents of objects drawn below it - i.e. with a smaller depth value - are not fully obscured. Note that the postscript output created by print_window does not support opaque region or histogram fills; instead the opacity is taken to be 1. The relative depth of the objects can be changed - by altering the depth attribute or using the various "shuffle commands" (shuffle, shuffle_back, shuffle_front, shuffle_backward, shuffle_forward, and the set of shuffle_<object> routines) so that overlapping objects are not completely obscured if desired. This example uses the add_fov_region command - from the chips_contrib.regions module - to plot up the Field-Of-View (fov) files provided with each Chandra observation. In this example we show the areas of the sky covered by the Chandra observations of Abell 2142 with Observation Ids of 5005 and 7692. In order for the add_fov_region command to be used, the chips_contrib.regions module has to be loaded (this only needs to be done once per session). If the import fails then please ensure that the latest version of the CIAO contributed-scripts package is installed. The add_fov_region command creates a set of regions, one for each chip in the FOV file, with the given region attributes. In the first call we use the default region preferences, whilst the second call changes all the color attributes of the region to brown. The final commands remove the axis labels, increase the left margin of the plot, and set up a plot title; note the support for LaTeX-like commands in labels. The default opacity for the region fill is 0.5, which means that it is possible to see how the ACIS chips overlap in the multiple observations. It does not, however, scale linearly with the depth of the observation. Here we overlay the FOV files shown in the previous example onto Suzaku and Chandra data of Abell 2142: the Suzaku image is a smoothed version from the Suzaku archive and the Chandra data is the same as used in earlier examples. In this case we turn off the region fill for both FOV files, although this is not necessary. 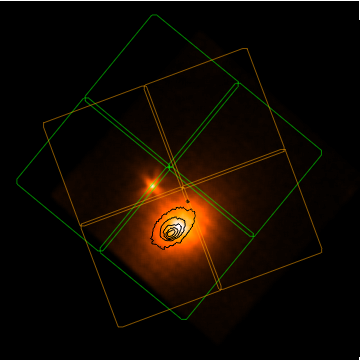 Since we set fill.style to nofill, the FOV areas are indicated by green and orange polygons on top of the image. The panto command is used to ensure that the outlines of the ACIS-I array from both observations are within the plot area. The final commands remove the axes and plots from the display and then re-sizes the plot so it fills the display. to display all of the Suzaku image. 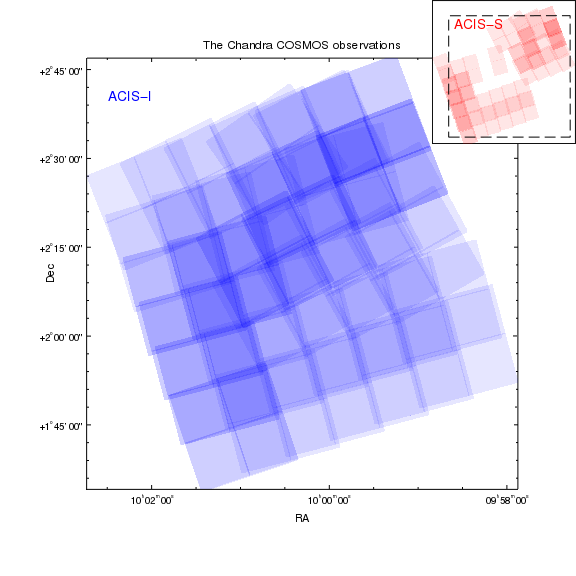 Here we use the add_fov_region command to display the coverage of the Chandra observations of the COSMOS survey (it does not include the COSMOS-Legacy fields). The FOV files used are named fov.<obsid>.fits, and are copies of the archival files, which have names like 7995/primary/acisf07995_000N001_fov1.fits. 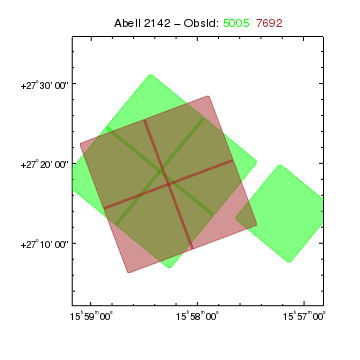 # Add the ACIS-S data in a separate plot in the top-right corner. # We use a frame so that the background does not show through. In this example we set up the window to have a white background and to draw objects in black, by setting the foreground.display and background.display settings, which matches the values used for the hardcopy outputs created by print_window. This can be useful when using partially-opaque regions, as we do here. The glob routine is used to select all the FOV files that match the given pattern; these are then iterated through one at a time and regions created for the ACIS-I array (blue) by using the ccd_id Data Model filter in the add_fov_region calls. Once the ACIS-I regions have been displayed the plot margins are adjusted slightly to better take advantage of the window. to see how the visualization would look if done all in a single frame). The WCS Axis grids example shows an example of an inset plot created without adding a second frame. The regions are partly opaque which means that it is possible to see how the ACIS chips overlap in the multiple observations. It does not directly relate to the resulting depth of the observation. Note that the final visualization depends on the order that the FOV files are added, which in this case depends on the value returned by the glob command.